Scotland Yard's Ian Rutledge seeks a killer who has eluded Scotland Yard for years in this next installment of the acclaimed New York Times bestselling series. An astonishing tip from a grateful ex-convict seems implausible—but Inspector Ian Rutledge is intrigued and brings it to his superior at Scotland Yard. 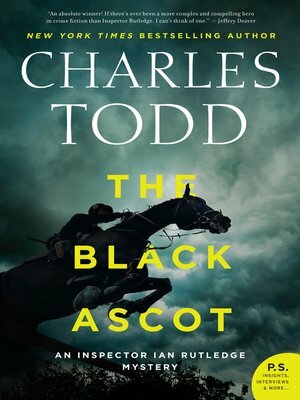 Alan Barrington, who has evaded capture for ten years, is the suspect in an appalling murder during Black Ascot, the famous 1910 royal horserace honoring the late King Edward VII. His disappearance began a manhunt that consumed Britain for a decade. Now it appears that Barrington has returned to England, giving the Yard a last chance to retrieve its reputation and see justice done. Rutledge is put in charge of a quiet search under cover of a routine review of a cold case. Meticulously retracing the original inquiry, Rutledge begins to know Alan Barrington well, delving into relationships and secrets that hadn't surfaced in 1910. But is he too close to finding his man? His sanity is suddenly brought into question by a shocking turn of events. His sister Frances, Melinda Crawford, and Dr. Fleming stand by him, but there is no greater shame than shell shock. Questioning himself, he realizes that he cannot look back. The only way to save his career—much less his sanity—is to find Alan Barrington and bring him to justice. But is this elusive murderer still in England?